Matcha Ice Cream just sounds trendy doesn’t it? Summer is my favorite time of year. This weekend we were busy spending time outside, barbecuing, and mingling with friends. Actually this weekend I did not cook a single meal. My husband made breakfast and both nights we ate at our friends’ houses. Stepping out of the kitchen and not having the “burden” of cooking a meal has really inspired me and excited me to get cooking again. I have a good list of food I want to make and share with you soon. On Saturday evening we joined a small group of people at a sushi making party. It was so much fun and I can’t wait to have my own sushi making party so I can share pictures and recipes with you. For the party, I wanted to make a fun dessert that would compliment the sushi theme. 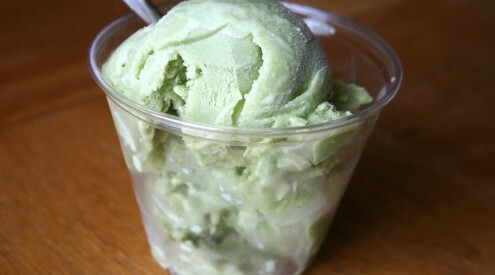 At Whole Foods, I found sweet matcha powder and used that to make homemade green tea ice cream. Before making the ice cream I hadn’t tried green tea ice cream before so I wasn’t exactly sure what flavor I was trying to create. The ice cream was smooth, sweet, and creamy with a subtle green tea flavor. Everyone seemed to enjoy it at that party. My daughter’s loved the (natural) green color of the ice cream. I am looking forward to cranking out many delicious ice cream recipes this summer. Warm milk, sugar, and salt in medium saucepan about 3-5 minutes. Pour cream into a large bowl and whisk in green tea powder. Set mesh strainer on top. In a medium bowl, whisk the egg yolks together and slowly pour in the warmed milk mixture, you don't want scrambled eggs so pour slowly and whisk constantly. Pour the contents back into the pan and stir over medium heat with a heatproof spatula. Continue to stir until mixture thickens and coats the spatula. Remove from heat and pour the custard through the strainer, stirring it into the cream. Whisk vigorously to dissolve the green tea powder. Stir until cool over an ice bath. Chill mixture thoroughly in the refrigerator, then freeze it in your ice cream maker according to the manufacturerâs instructions. I will have to try this one very soon! Looks delicious! Matcha is becoming a must have ingrident in my ktichen. The ice cream looks delicious.